It’s almost time!! We will begin at 5 cst on Friday. Please spread the word everybody! This post will always be the top post so that all our new visitors wont have to search through previous entries for the details. For the most recent post look directly below this one, thanks. During each session (session being the time between the start of a game and the ending) everyone who e-mailed us during that session will be put into a drawing for that specific session. No matter if you send us 1 email or 100, you have the same chance of winning. After the completion of a game a name will be drawn and announced using a randomizer program. That means any one person can have a total of 7 chances to win if you send us an email during all 7 sessions. In the emails you don’t need to say anything in particular like “enter me in the contest”, you’re automatically entered. We would simply like you to speak your mind, say whatever you want, ask whatever you want. Please do not use multiple email accounts! You can email us multiple times on one account, we encourage that and would love your feedback; just don’t use multiple email accounts to enter more than once in each session. If you get caught doing this we will have to disqualify you from the drawing. The prizes are sent both via Mail, and also through Nintendo’s Shop channel gift system. This prize give away is a worldwide event, not limited to America. I’m not real sure on how the Virtual gift system, works..I’m hoping I can send Virtual console games to everyone, I’ll do some more research and report my findings. The Prizes and shipping are paid for by us, all donations are going to St. Jude Children’s Hospital. 100% of all donations will go to St. Jude Children’s hospital. The Donation button is in the top right corner of the webpage; if you’d like to donate pre-event, feel free to. After thinking awhile on the topic of donations, I’ve came to a conclusion. At first I didn’t want to take any donations to avoid any controversy. 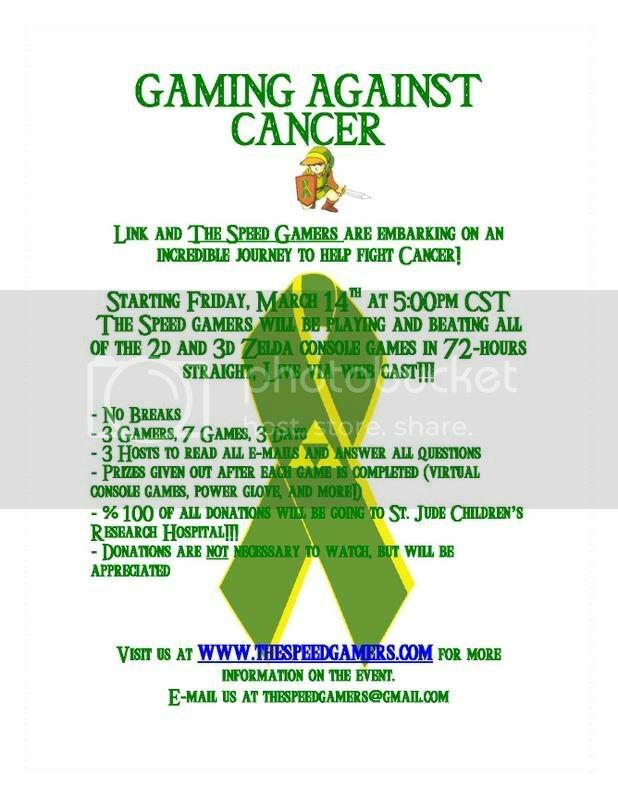 I had a change of heart and have decided that since we are going to be gaming for 72 hours straight we might as well do it for a good cause. The next decision was what charity should we donate to? I thought of Childs Play because gaming and Childs Play go hand in hand…no brainer. But then I wanted to think for a little bit longer before I took a leap and announce a charity. After a couple of minutes I knew exactly where the money would go. You will be hard pressed to find anybody who cancer has not affected their lives. Going through the list of people involved in the marathon triggered the idea initially.Two of the three possible hosts have lost very close family members due to cancer, and I personally would not be able to handle mentally what they have had to. Furthermore, several of my close friends that won’t be doing the marathon, I’ve also seen affected in ways I couldn’t imagine. I know it’s not just my friends who have had to deal with cancer, in some way or another everyone has, sadly some much more than others. All these reasons contribute to why we will be donating to a cancer foundation. We’ve received several emails from people asking how they could help us out. We’re flattered by everyone’s offers and have made a flier to help us promote the event. If you could print these and put them wherever,whenever, that would be awesome; any help will be appreciated. Also, any post on forums or links sent out will help spread the word. I’ve tried to figure out the best way of doing the prize system, and this is what I have come up with. During each session (session being the time between the start of a game and the ending) everyone who e-mailed us during that session will be put into a drawing for that specific session. No matter if you send us 1 email or 100, you have the same chance of winning. After the completion of a game a name will be drawn and announced using a randomizer program. That means any one person can have a total of 7 chances to win if you send us an email during all 7 sessions. In the emails you don’t need to say anything in particular like “enter me in the contest”, you’re automatically entered. We would simply like you to speak your mind, say whatever you want, ask whatever you want. Please do not use multiple email accounts! You can email us multiple times on one account, we encourage that and would love your feedback; just don’t use multiple email accounts to enter more than once in each session. If you get caught doing this we will have to disqualify you from the drawing. The prizes are sent both via Mail, and also through Nintendo’s Shop channel gift system. This prize give away is a worldwide event, not limited to America. I’m not real sure on how the Virtual gift system, works..I’m hoping I can send Virtual console games to everyone, I’ll do some more research and report my findings. The Prizes and shipping are paid for by us, all donations are going to St. Jude Children’s Hospital. Thanks to both you guys! Awesom Job. If anyone else would also like to make a youtube promo, send us your video and we will post it on our site! Heres a heads up for everybody,prize details will be revealed Monday! Thanks for all your support and mail. Just wanted to keep everybody up to date and let you know that we will be releasing a youtube promo soon, one made by us and another made by a supporter. Also, a full list of the prizes and prize details will be announced within the week. All prizes will be paid for by us, and WILL NOT be taken out of the donations. 100% of the donations we get will go to St. Jude Children’s Research Hospital. We would also like to thank Will D’angelo again from www.thewiicast.com. Thewiicast has spread the word tremendously and brought us many supporters. We cant thank Will enough. TheSpeedgamers would also like to give a big thanks to www.mywii.com.au for posting a story about us. They have also help spread the word greatly. All in all we have received viewers from over 20 countries now! Lastly, we will be putting out a flyer soon that you will be able to download from our website. Any help speading the word will be appreciated. We’ve had one viewer named Tommy from California who printed out over 100 copies and posted them in his school, awesome Tommy. Thanks again everybody, until next time! UPDATE: We’ve had a couple requests so we will be putting up the donations link early (upper right hand corner of the webpage). Remember, you DO NOT, I repeat, DO NOT, need to donate to watch us or enter any of the drawings for prizes, so don’t feel any obligation to do so. Everything is completely 100% free. If you’re Zelda fan that would like to simply watch 72 hours of Zelda, feel free to kick back and enjoy. We are going to send all the donations to St. Jude on March the 18’th, that way we can total all our donations to see how much we have raised (We will keep everyone updated on our donation amounts as they come in).100% of all donations will go to St. Jude Children’s Research Hospital.